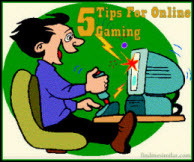 Five Tips For Online Gaming '+g+"
An online game is a game played over a computer network or the Internet. If you think you might be interested in online gaming then the first thing to know is that there are masses of gaming options available to choose from. Games range from simple text-based games, free flash games for one player, multiplayer word games, Facebook apps right up to much more sophisticated multi-level, multi-user subscription fantasy games such as World of Warcraft (WoW). There are also plenty of websites featuring online gambling games such as Bingo, Poker, Black Jack and betting. 1) What type of game you are interested in playing - there are literally thousands to choose from, and for all ages (from pre-schoolers to OAPs) and budgets. Think about whether you are interested in sci-fi or fantasy games, role playing, word games (e.g. Scrabble, Boggle), platform games (e.g. Sonic the Hedgehog), shoot ‘em up (e.g. Halo), or text based, arcade etc. You might want to play games on Facebook – there are loads available, including SongPop, word games, Bejewelled Blitz, Candy Crush Saga etc. But be aware that some of the more addictive games Facebook games, such as Farmville, may deluge your Facebook friends with annoying requests. 2)Your budget – there are lots of free games available to play online on sites like Addicting Games, Miniclip and Free Arcade. These websites carry a wide range of puzzle, word, and arcade style games. These types of games are great fun and are often highly addictive. I once spent several months compulsively playing a puzzle game called Santa’s Balls! Watch out though – some free games like Candy Crush Saga will only let you do a few levels for free, once you are hooked you have to pay to unlock new levels. The down side of free gaming online is the annoying pop-ups and persistent adverts. If you have a slightly bigger budget you may want to consider one of the subscription gaming websites – these come without the advertising. Watch out though, some of the more popular multi-player games like WoW can be expensive – to begin with you buy the game, you then have to pay a monthly subscription, and you will also want to buy any expansion packs as they come out. There are also many betting and Bingo (e.g. Butlers Bingo) websites to choose from. Tip: Make sure you set you set yourself a spending limit and stick to it as it is easy to get carried away. 3)What your computer or device can cope with - some older phones, ipads or PCs may not have the capacity or speed to run some of the newer and bigger games, and games don’t always work smoothly on every browser – if you run into problems it may be worth checking out the gaming forums to see if you need to change your browser. And remember that flash based games will not work on the ipad. You may also find that you need to update your version of Java to be able to play online. 4)The reliability of your internet connection – a fast broadband connection is essential for most online games – especially the more complicated ones. If you are on 3g, or your connection is through a phone line, you may be frustrated by losing your connection in the middle of a game – and you could miss a valuable win if you are in the middle of a game of Poker or Bingo. 5)Staying Safe – choose age appropriate games -if you are a parent make sure that you know what your children are doing when they are online. If you have children you may want to put an Internet filter program on your computer, but be aware that this will also stop you from looking at more adult content. Remember that you should apply the same rules in a gaming chat room as you would in any other chat room. Don’t give away any personal, details or passwords, and report anyone making inappropriate suggestions or wanting to meet up. Author Info: Jason Falls is an online gaming fantaic, he likes to think he knows all there is to know about Bingo and online gaming.